"I will miss Jim's smile and wonderful welcome. He demonstrated his love for his "
"I first met Jim 57 years ago when he showed up in a brand new 56 Dodge to date m"
"May the Lord bless you and keep you. May this candle burn on to represent our lo"
GRAY, James Philip, 84, of Stow, Massachusetts, formerly of Maynard MA and Philadelphia PA, passed away surrounded by family on August 21, 2018 in Falmouth, Massachusetts. Beloved son of the late Marion McIntyre Gray and James Lawrence Gray. Devoted husband of 57 years to Joyce (Lippo) Gray. Loving father of Joyce Morrill and her husband Jeffrey Morrill of Lexington, and Susan Gray of Weston and Paul Donato of Boston and Falmouth. Proud grandfather of Valerie and Diana Morrill, and Sam, Nellie and Leo Wisnia; former father-in-law of Adam Wisnia of Weston. Brother-in-law of Sue and Joseph Lippo of Woodhaven MI and Mary and Richard Lippo of Mount Laurel NJ, and uncle to many cherished nieces, nephews, grandnieces and grandnephews. James grew up in Philadelphia and earned his undergraduate and graduate degrees in electrical engineering from Drexel Institute of Technology. He worked as an engineer, educator and town committee member. 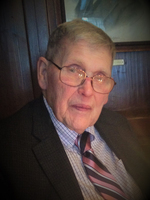 His long career in engineering spanned work at Univac in Blue Bell PA and Raytheon in Wayland MA, and for many years he taught students in electronics, physics and math at MIT, Wentworth, Middlesex Community College and Mass Bay Community College. Viewing hours will be held on Monday, August 27 from 5:00 P.M. to 7:00 P.M. at The Church of St. Isidore at 429 Great Road (Rt 117) in Stow beginning with the Reception Rite and Vigil Liturgy at 5:00 P.M. followed by visiting until 7:00 P.M. A Mass of Christian Burial will be celebrated at The Church of St. Isidore at 10:00 A.M. on Tuesday, August 28 with burial immediately following services. In lieu of flowers, please make a donation to Emerson Health Care Foundation, Inc., 133 Old Road to Nine Acre Corner, Concord, MA 01742, online at https://www.emersonhospital.org/support-emerson/about-the-foundation; or to the Stow Friends of the Council on Aging, P.O. Box 97, Stow, MA 01775. Please note on the memo line "In Memory of James P. Gray." Thank you.